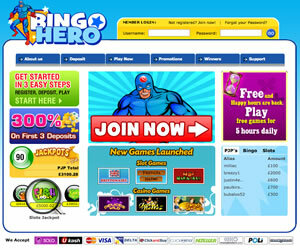 If all the pretty pink sites are aimed at girls, then the superhero-esque Bingo Hero is surely one for the boys? The site theme is blue, and features the very hero namesake that gives the site its name. That's not to say the site isn't for everyone, there may be plenty of lady players out there who need rescuing by a man who wears his underpants on the outside. There are all sorts of sign up bonuses, deposit specials and promotions on the homepage, and signing up for a new account won't require any superhero powers (unless you have accounts with other brands on the Best Bingo Network in which case you may come across a few issues!) There are all sorts of generous sign up bonuses and deposit bonuses running at Bingo Hero all the time, so you always get the chance of a boost to your balance before you even play a game so make sure you take a look at the promotions to see what's on offer. Whilst this all looks very good on paper, read the small print (Terms and Conditions) before you get yourself too excited! No deposit bonus not credited instantly'¦. The same issues as suffered with many a Cozy Games brand! If you like a good selection of bingo games and aren't too worried about being able to withdraw your cash, then this may be the brand you are looking for though There's no software to download and there's a selection of 90-ball, 80-ball, 75-ball and 30-ball speed bingo to choose from. The software isn't the sleekest around, but it plays well. In the game screen, tickets take pride of place in the centre of the page, while chat appears to the right. 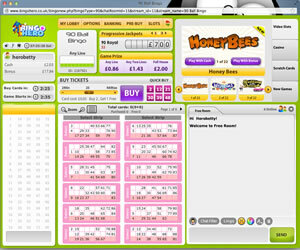 The game tickets are clear and easy to read, chat is busy and fast moving, and there is a real community feel at Bingo Hero. There is a selection of mini-games above the chat box, and as these games are integrated into the play screen, it's easy to keep track of everything that is going on. The game screen is very well laid out, easy to understand and user-friendly. If you enjoy the rewards that come with playing at the same site regularly, then make sure you take a look at the promotions page, it's jam-packed with special promotions, prize games, pre-buys and deposit specials and that means there are plenty of extras to be won while you play. You also get the chance at winning a jackpot in many of the games at Bingo Hero, in the game lobby you will see that several rooms have a progressive jackpot, this grows every day and all you have to do to win it is bingo in the required amount of calls. Beware though, with the capped restrictions on withdrawals, it may take you an age to get your cash! And of course, bingo sites are never without side games too, so if you're a fan of slots, instant wins and casino games then you'll be pleased to know that there is a huge array of them at Bingo Hero, and many of the slots available also have their own big jackpots to be won. The only plus point about the brand is that you can play the slots with bonus cash as well as real money. 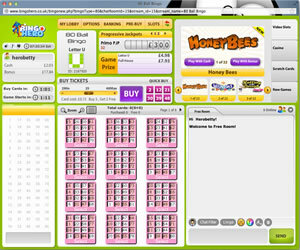 The site design may feature a 'њBingo Hero'ќ but to our mind, like most of the Cozy Games brands, it would be better branded as 'њBingo Villain'ќ. 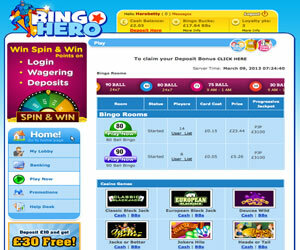 Bingo Hero has four different variants of the online game available at their site; 30, 75, 80 and 90 ball. Alongside these you will find a wide variety of instant win games, all of which can be played using either cash or bonus funds. Wagering requirements with Bingo Hero are variable dependent on both the games you are playing and the bonus option you have chosen. You can find all the details of these in the FAQ section of the site under the Withdrawal Rules section.